I was recently informed by a naive young employee of Grameen America that '99% of all loans are repaid by Grameen's American borrowers.' However, evidence from Grameen Foundation would seem to prove quite conclusively that this anecdotal claim must be a financial fairy story. The same evidence also proves that, as recently as 2011, the naive head of Grameen Foundation, Alex Counts, did not have the slightest idea of the danger which the 'MLM income opportunity' lie poses not just to the poor, but to the very concept of micro-finance. if prior loans are paid on time (as almost all are). Alex Counts (unwittingly) chatting with 8 of the many poor, Latino, immigrant women who have been deceived into thieving from Grameen America on behalf of the 'Herbalife' racketeers. (It is also interesting to note that Mr. Counts also repeated the financial fairy story that almost all loans are paid on time by Grameen's American borrowers). Exactly what percentage of these 'Herbalife'-related loans have been repaid? 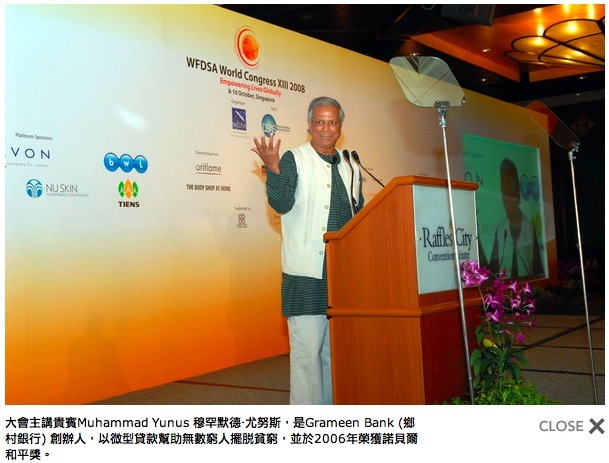 Frighteningly, the actual inventor of micro credit, Professor Muhammad Yunus, has appeared as key-note speaker at a Congress of the so-called 'World Federation of Direct Selling Associations.' Apparently, Prof. Yunus was also too naive to know that the majority of so-called 'Direct Selling' companies, like'Herbalife' have been the corporate fronts for an insidious form of cultic racketeering which enslaves the poor by offering them the illusion of future financial freedom. What sort of poor, Latino, immigrant woman (living hand-to-mouth in a tough NY neighborhood) borrows $1500 from a micro-finance institution to buy piles of non-essential products that (even with the discount) cost several times as much as equivalent, non-essential products in a discount store?